Last fall, my employer started posting a crossing guard at one of the more heavily trafficked spots on campus. I had been aware of this but just encountered it for the first time yesterday. My reaction is decidedly mixed. My first inclination was to decry it as just another example of how we increasingly infantilize young adults. On second thought, I realized that pedestrians die fairly regularly on college campuses, and crossing guards such as ours are likely saving lives. This one admittedly has me scratching my head a bit. I would propose a third option, that does partly include both of your thoughts, with the addition of it being beneficial to the motorists. 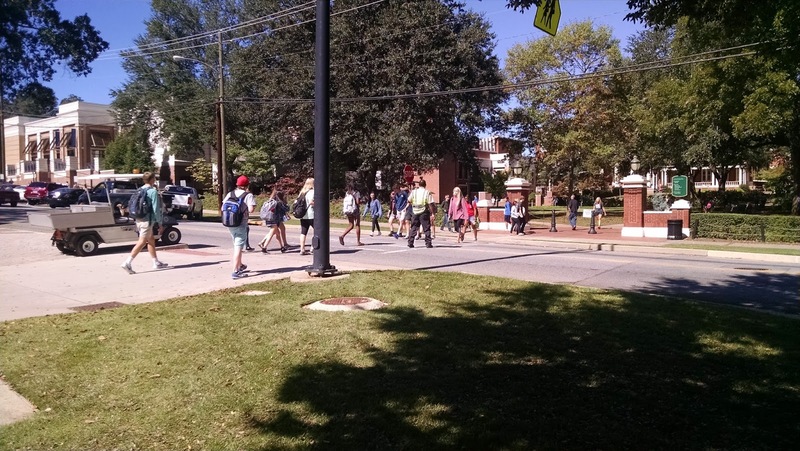 Prior to being in place, it was not common for so many students to be continuously crossing that without any vehicles being able to pass that traffic would be backed up through two intersections. Having some sort of control there is necessary. My biggest surprise is that there is not an electronic traffic control there or at the Montgomery Street crossing.